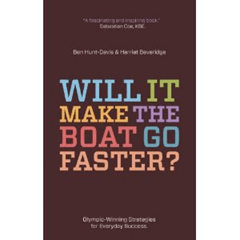 This is not only a great question, it is also the title of a brilliant book from Ben Hunt-Davis and Harriet Beveridge. Ben is a good friend and colleague at the British Olympic Association. We work in the same department with different roles but with the same aim: helping our athletes and coaches in their quest for Olympic success. Ben is an Olympic Gold Medallist from Sydney Olympics. In this book he writes about his story and how his team was able to win Gold. Most of all, describes the techniques used by him and his crew in preparation for the Olympics. It is a true description of the difficulties of working as a team to reach a goal and accomplish something great. Ben’s story is brilliant because it shows how a pretty normal guy willing to put a lot of hard work into something can accomplish amazing things in pretty much everything. The Book is divided in 12 chapters. In each chapter there is the story and then a summary with some practical applications of the techniques discussed in the real life example of the winning men’s eight rowing team. It is easy to read and easy to follow as well as packed with some useful and easy concepts to be applied in every activity. The main motto is the one making the title of this book. In fact, in Ben’s terms everything we do should always be questioned to make sure it impacts on the most important outcomes. In his example, everything was about making the boat go faster. Every activity was questioned and only the ones able to help making the boat go faster was implemented. Working in high performance sport I can say that we are swamped with possibilities and solutions for our athletes. However we should always look at the impact of every activity (training method, technology, nutritional intervention, logistics etc.) on the end result. Most of all at the likelihood of a positive impact versus the effort needed to implement it. So, since working with Ben, I have adopted and use a lot his usual question in everything I do: “will it make the boat go faster?”. So if you want to know more, get a copy of this book, I am sure there will be some useful lessons to be learnt and a great story to read. End of the year reflections and thank you!